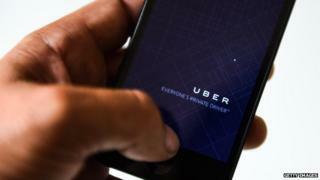 Taxi booking app Uber has been fined $7.3m (£4.6m) in California for not giving regulators enough information about its service and operations. A judge at the California Public Utilities Commission - the regulator that allows the company to operate in the state - said Uber had not filed all the reports required by the body. It was accused of withholding details on incidents such as accidents. Uber has been involved in legal battles around the world over its operations. The San Francisco-based firm's services in US cities such as Portland, Oregon have been suspended after a disagreement with the city, while its practice of offering unlicensed taxi drivers has been banned in countries like Germany and Italy. Uber's app allows passengers to request rides from drivers in the area and its fares are generally lower than those of traditional taxis. The company has also been accused of not giving data on how often it provided access to disabled passengers in California. Uber has defended its operations in the state by saying it has given enough information to the commission. After the ruling, the firm said that it would appeal against the decision. The company has up to 30 days to appeal before its licence to operate in California is suspended. Will London's mayor put the brakes on Uber?